All the things to know if you're planning on buying this product. With its powerful 1200 W Vortex Motor and suction control with six different settings, this versatile floor cleaner is built for all kinds of surfaces and a whole lot of pet hair. Continue to our full review, or check out real user reviews on Amazon. You never have to worry again about dander and dust escaping back into the air—Miele’s unique AirClean filtration system captures and retains over 99.9% of all particles. 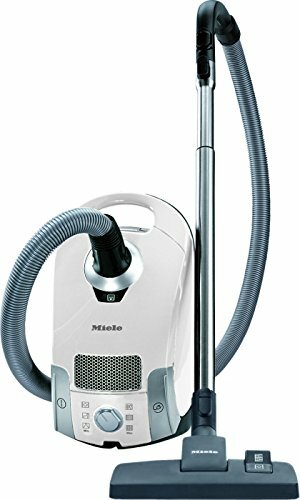 The telescopic, stainless steel designed wand with the powerful suction control makes Miele Compact C1 canister vacuum a versatile appliance recommended for households and users who have hard floors—and a lot of pets. Even though this model is designed to handle low pile carpet as well as some occasional rug, it works best on hard surfaces. It is equipped with two standard flooring attachments, including a dual-action floorhead. This vacuum does not just pick up dirt and debris, but it also removes harmful allergens from the air at home with the AirClean sealed system that can oust annoying and relentless pet hair and dandruff from the exhaust air blown back into the room. Are you looking for a compact yet powerful canister vacuum to tackle that pet hair problem? Something high-quality and long-lasting, but not out of your price range? Miele Compact C1 Pure Suction could be the perfect vacuum for dealing with those pet-related messes. This German manufacturer of high-end domestic appliances works tirelessly to provide homes with the household equipment necessary, efficient, convenient, and flawlessly functional to make cleaning and maintaining a home as easy as tapping your foot—on a switch that is. With just a tap of your foot on a rocker switch and a spin on the rotary dial, you can switch the Miele Compact C1 Suction Canister Vacuum from a hardwood floor’s hero to a carpet-cleaning fiend. Although ideal for the low-pile carpeting in your house and smooth flooring laid out in your kitchen and living room, this vacuum can still easily do it all - carpets, stairs, furniture, curtains... everywhere you can expect to find pet hair and pet-related messes. With its long electrical cord that can have you easily move from room to room without having to look for another outlet and an automatic rewind, the Miele Compact Vacuum can boast a total cleaning radius of 29.5 feet. Other conveniences include three accessories: a Dusting Brush, Upholstery Tool and Crevice Nozzle, held in place by a VarioClip to keep them at hand at all times. Here we are talking about its compact and lightweight canister body and the foot pedal cord winder. Especially when you are in need of making the most out of your space as possible, it'll benefit to invest in appliances that can take as little room as possible and require as little effort to do so. With its compact canister body, the Miele Compact C1 Suction Canister Vacuum is small and convenient, which makes it much more mobile and easier to store—weighing in at just under 15 pounds—it’s light enough to easily carry around with you. You can also rely on the foot pedal cord winder, which, with just a step on the foot pedal, you can wind the cord neatly up and inside, eliminating entangling the cord for the next cleaning session and reducing work for you since you don't have to wind it up manually. The suction motor of this model operates with 1200 watts, which gives enough suction to provide efficiency when cleaning—just like a powerful, traditional vacuum. This high-performance motor is under an ultra quiet setting, built for high performance as well as longevity. After running a 1k Hours Test, manufacturers have ensured that this canister vacuum cleaner can hold up for the average residential use for just over 20 years. Because of the standard life expectancy of the motor that reaches 1200 hours, the manufacturer offers a 7-year warranty for the motor alone—which makes for a really long life as a vacuum cleaner. This model is also equipped with a 6-speed suction rotary dial. This feature allows you to select from 6 power settings to ensure the correct level of suction is used on the surface being cleaned. Every setting may be selected corresponding to the type of surface that you are working on, as well as other factors that you may have to take into consideration—depending on the task at hand and where you're going to be working at. This liberty in choosing the right setting gives you better control over the tool’s suction power giving you an effective clean. For example, you can easily switch over to the max suction setting for hard flooring, medium suction for carpeting and low suction for drapes. This technology is unique to cleaners under this brand name, setting this vacuum apart from the rest. Even though this vacuum with these tools are considered as the least expensive produced by the manufacturer, it does not compromise quality and overall performance—especially with the AllTeQ Combination Floorhead (STB 285-3). This classic combo combines the use of an area rug tool and hard floor tool. This brush has two different settings—for hard surfaces and for carpet. The nylon bristles are used to clean hard surfaces, which are then retracted with the simple, push-down foot pedal. The velvet strips underneath the vacuum will then be exposed, allowing the vacuum to glide across carpeting and using suction to make its mark in giving the floor an adequate clean. It is ideal for use in homes with hardwood, tile, terrazzo or laminate. Since these types of homes usually have doormats, low-pile area rugs, and others, this vacuum cleaner can work as a multi-purpose tool which can work in effectively vacuuming the above-mentioned surfaces. This also means that if you have high-pile or dense area rugs, as well as wall-to-wall carpet, this may not be a recommended option and you would be better off considering a different, more heavy-duty upright vacuums. Miele has also incorporated a revolutionary technology in the latest AirClean dustbag feature. It provides several unbeatable advantages which enhance the overall performance of this model by using FJM AirClean bags. For one, this unique material increases the quality of the filtering system. These bags have the highest level of dust filtration in all vacuums, which means—no matter how small the Miele Compact Vacuum is, it still has a quality dustbin inside. Each of these bags is designed with 9-ply constructions and contains features (only found in quality cleaning supplies) like a self-sealing spring loaded top to trap dust upon bag removal. This feature is responsible for the reduction of dust emissions by up to 50% when changing the dustbag. Since the dustbag uses a specially designed polymer rugged-spun material, it is tear-proof, removing the need to worry about the potential damage that is caused by pointed, sharp objects inside the bag—which sometimes happens when you're vacuuming and not paying attention. No one wants to lift up the dust bag when changing it only to notice the contents pouring out and causing a mess! This means that aside from working on your floors at home, you are also making sure that cleanliness in the air is maintained, thanks to the filtration system that captures and retains over 99.9% of the unwanted air particles. This model is equipped with a multi-layer filtration system which focuses on improving the quality of air inside your home. With the Miele Compact C1 Suction Canister Vacuum, air passes through the AirClean Bag, and then through the secondary electrostatic filter before it reaches the special exhaust filter. This multi-layer filtration system ensures that big particles and pet hair will not block the exhaust filter. Since there are two different filters combined with HEPA approved bags, the filtration system makes the Compact C1 Vacuum the ideal household appliance that can maintain purified air in your home—regardless of all the pet-children, you may have. The company Miele boasts that the filtration system is designed so that it is a completely sealed air filtration system which forces all the air directly through every level of filtration, with absolutely zero air leakage along the way. This means that you can feel assured that you will not be getting any dandruff or pet hair back out of the vacuum and into the air you and your family breath. Miele’s promise is that with this unique AirClean Sealed System, it will capture and retain more than 99.9% of all particles. This model is very effective in cleaning pet hair from different surfaces. No matter how many pets you may have around the house, the Miele Compact C1 Vacuum can take care of it. Despite the fact that it may only provide the standard features and not the more advanced capabilities that are usually found on more expensive models, pet hair removal is in its strong features (with all the available additional attachments, as well). With this vacuum, you have the assurance that you can maintain a pet hair free home, while making sure that air is also filtered accordingly, removing the worries of any potential allergic reactions. This model is ideal for use on low-pile carpet. If you need to clean medium to high pile carpet, as well as wall-to-wall carpets, you may not be able to expect a lot from this model. This model performs betters on bare floor and hardwood than it does on carpets. The Compact C1 suction canister vacuum works really well on the bare floor. This is made possible with the incorporation of the SBD285-3 classic combo feature. As such, it is ideal for homes with hardwood, tile, laminate, as well as terrazzo. This vacuum cleaner can also clean upholstery and is more than efficient in doing so. It does not come with a motorized brush, which is a downside, but it does come with a felt-lined upholstery tool and strong suction. Together these two are quite effective with embedded pet hair on most fabrics. This model comes with a standard flooring attachment for hard floors and carpets and three above-floor cleaning attachments. AllTeQ Combination Floorhead – This attachment comes with a simple foot tap for the switch, allowing you to transition easily from working on hard floors to low pile carpets, without having to change attachments. This can save a lot of your time while cleaning. Aside from the floorhead, this model is also equipped with 3 standard cleaning attachments. All of these attachments are stored on the VarioClip and may be attached to the handle, near to the machine body making them conveniently available at all times. These attachments include an upholstery tool, a dusting brush, as well as a crevice nozzle. To sum it all, the Miele Compact C1 Suction Canister Vacuum is a dependable option for taking care of the pet hair, dander, and dust around your house. It is one of the high-ranking choices because of its affordability, without compromising performance and quality. On top of that, it also features the manufacturer’s unmatched, patented filtration system. With all of these features highlighted in this model, you have a vacuum cleaner which is ideal for homes with hard floors. While it may be absent of some advanced features that are usually found on more expensive models, it is powerful enough to deal with the task you have at hand: cleaning after pet hair.